In S1, we have the opportunity to learn to play different classroom instruments. These are drum kit, tuned percussion, keyboard, guitar and bass guitar. We develop our knowledge of musical notation whilst we engage with these different instruments. Not only do we learn to play these instruments, we have the opportunity to develop our skills on the instruments as we play together as a class. In addition to this, we look at topics such as the ‘Instruments of the Orchestra’ and develop our listening and understanding music skills and our compositional skills. In S2, we build off our knowledge of what we learnt in S1. We continue to play different musical arrangements as a class whilst gaining a deeper understanding of the musical world around us. We cover topics such as ‘Music in the Media’ and ‘Pop Music’, and continue to get creative in different composition tasks, whilst listening to plenty of good tunes. 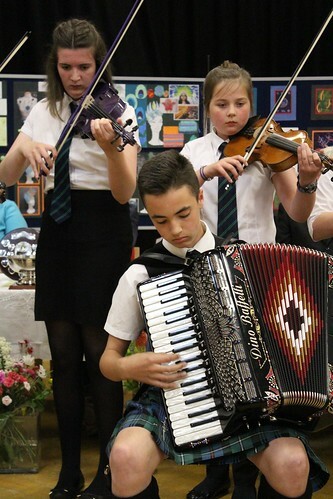 If you pick Music in S3 and S4, you will begin with ‘Scottish Music’ and will carry on by covering the topics involved in the National courses. S3 and S4 begin to look at solo performance and have time to practice individually in class to deepen their now established musical skills. Taking part in ‘Song of the Day’ involves them listening to a song of their choice and picking out the different concepts that they can hear. 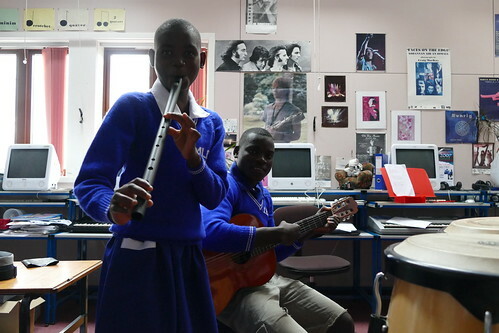 Applying music to their own surroundings and developing their performance skills increases an understanding of music and a confidence in music. Picking Music at Higher takes all the skills and knowledge that has been learnt and exposes it in new ways. It is a continuation on from the National course and involves applying more concepts to the different musical styles. Higher Music once again involves performance and compositional skills that allows the chance to be creative and put your own mark on the musical world.